Dapchi girls reportedly released – Royal Times of Nigeria. The 110 School girls recently kidnapped in Dapchi, Yobe State on February 19th may have been released by their captors. The leader of the parents of the missing girls told newsmen that he has been told of the release of the girls but was heading for the location to confirm the report. One of the fathers of the abducted girls, Amharic M-grah, said he has seen his daughters. “The report is true. I have seen my two daughters who were kidnapped last month,” he told The Cable. “Boko Haram just returned the kidnapped girls this morning. They brought them back in the same set of vehicles which they used in conveying them last week,” the resident said. There are however fears that five of the girls died in captivity. BBC’s Stephanie Hegarty wrote on her twitter handle: Confirmed from several sources. 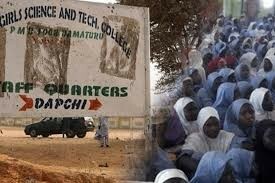 Girls have been returned to Dapchi. Not clear if all 110 are there or not.